As Arctic sea ice contracts and thins, marine transportation, energy exploration, and tourism activities are expected to increase, escalating the risk of oil spills and other accidents. The online mapping tool Arctic ERMA is a key part of equipping responders to deal with environmental disasters in the Arctic region, including throughout the State of Alaska. NOAA is also working with indigenous communities to learn how ERMA can best be used to protect the natural resources and unique lifestyle of the region. Arctic ERMA is an online mapping tool that brings together the available geographic information needed for an effective emergency response in the Arctic, including the extent and concentration of sea ice, locations of ports and pipelines, and vulnerable environmental areas. ERMA integrates data—some occurring in real time such as weather and ice radar—into a single interactive map, providing a quick visualization of on-the-ground conditions, and improving communication and coordination among responders and environmental stakeholders. Arctic ERMA supports the efforts of the Arctic Council's Emergency Prevention, Preparedness, and Response Working Group as a platform for data sharing, and is used during the council’s international response training, as required under the Agreement on Cooperation on Marine Oil Pollution Preparedness and Response in the Arctic (MOSPA). Arctic ERMA contains information on the locations and conditions of natural resources and habitats in the Arctic, as well as significant baseline data for Alaska. NOAA and other natural resource trustees rely on this information to plan for and carry out natural resource damage assessments and restoration following oil and chemical spills. 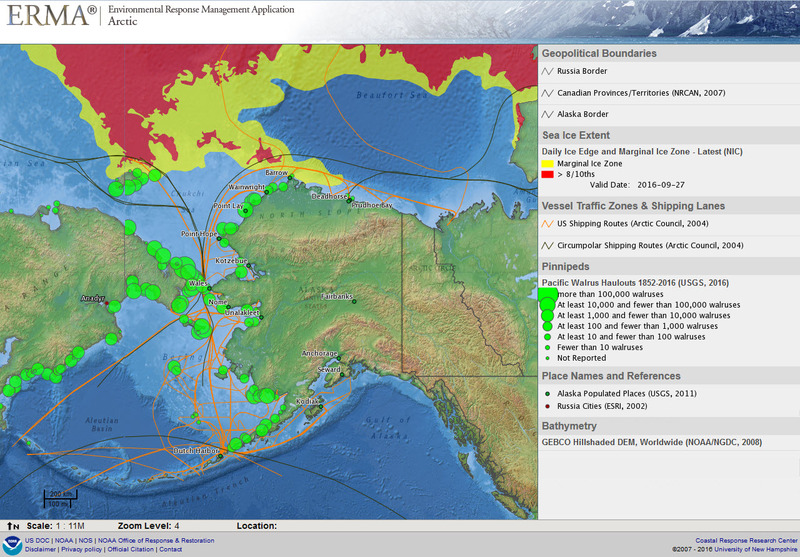 Arctic ERMA serves as a common platform for visualizing, sharing, and communicating data and information relevant to the restoration process. NOAA uses Arctic ERMA to assess natural resources at risk from pollution, plan for and track injury assessment, and determine appropriate restoration in the event of an oil or chemical spill. Arctic ERMA was developed with significant assistance from the Department of the Interior's Bureau of Safety and Environmental Enforcement. This partnership has improved access to key environmental, commercial, and industrial data sources throughout lease areas in the Arctic. Other partners include NOAA's Office of Ocean and Coastal Resource Management, the Oil Spill Recovery Institute, and the University of New Hampshire's Coastal Response Research Center. Arctic ERMA allow users to view important real time information and historical environmental data. This Arctic ERMA screenshot shows real time ice extent, shipping lanes, and pacific walrus haulouts.